Beginner & Intermediate Brioche Knitting, by Liat Gat of KNITFreedom is a very nicely done video course. Liat is a good teacher, and shows plenty of repetitions, demonstrating each technique using both Continental and English/American knitting. I particularly like how she uses her knitting mistakes as opportunities to demonstrate how to recognize and fix common errors. 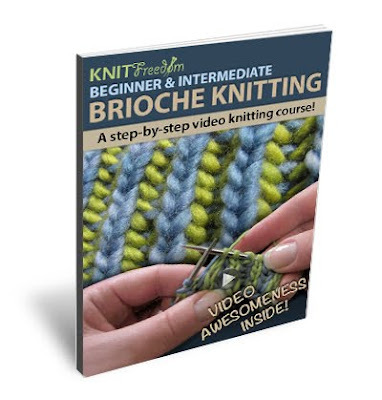 A couple of the videos focus specifically on reading your knitting--an essential skill for becoming an independent brioche knitter. The section on dropping down to fix a single stitch is worth the price of admission on its own. I don't know how many hours I've spent trying to wrestle that problem to the ground. In my photo tutorials on picking up dropped stitches in brioche, I had to admit I'd never been able to drop down one column and recover from it. If I had time right now, I'd be casting on a brioche project just so I could drop some stitches! I also learned a lot from the section on casting on and binding off. I hadn't realized that the Italian cast on can be combined with a tubular cast on. The video on the Italian bind off made clear that it's a useful technique, rather than a cruel joke. Much as I have benefited from Nancy Marchant's Knitting Brioche, I completely failed to follow her instructions for the Italian bind off (and for dropping down to fix a stitch). Videos can sometimes take you where still photos just can't. Liat does an excellent job of breaking the instruction into manageable chunks, so each video is short and covers a single topic. This makes it easy to take the time to work through a lesson, and then to go back and use the videos for reference when needed. The sound and videography are clear. The accompanying text is well-organized, both on her web site and on the PDF that "is" the e-book. You can either stream the videos or download them to your computer, and clear instructions are provided for each method. The full download is about 1.3 GB. My only quibbles are small and technical - a couple of places where the text and video don't exactly match, and the fact that the two-color brioche is done with two yarn colors that aren't clearly "dark" and "light." Also, the videos only covers basic ribbed brioche (aka fisherman's rib), although once you've finished the course, you probably wouldn't have much difficulty extrapolating to stockinette brioche. At first I blanched at the price of the video course (full disclosure - Liat gave me a free review copy). While the price is a bit high for a book, it's far less than the cost of a comparable live class. Plus, you know the teacher will be good, and you can take the class as many times as you want! And, having recently spent a lot of time compiling photo tutorials, I have a new appreciation for how much work it must be to produce high quality video tutorials. I await January's promised release of Brioche II - Advanced Brioche Knitting, which includes cables, increases, decreases, and multi-color brioche, with high anticipation. I noted in my Twist bio that pickled kumquats and cashew butter on waffles make a fine comfort food. I feel a little bad about tempting people to a condiment that is by no means universally available, so at the end of this post I have included more information on obtaining pickled kumquats. 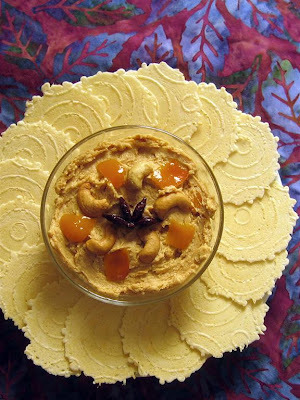 Since undiluted pickled kumquats are quite, shall we say, lively, I recently made up a recipe for Kumquat Cashew Butter that tones down the kumquats and makes a tasty spread for crackers or baguettes. Lacking pickled kumquats, one could probably substitute fresh kumquats (which are starting to come into season about now), perhaps cooked in a sugar syrup. Almond or hazelnut butter might also be an interesting substitute for cashew butter. Haddon House makes very nice pickled kumquats, and it might be possible to find them at the grocery store in some areas; they don't seem to be available online at the moment. As of this writing, pickled kumquats were available online from E. Waldo Ward . After I exhausted my first magical jar of pickled kumquats (which I had nursed along for some years) and discovered how difficult it was to obtain more, Matt came to my rescue last Christmas by giving me everything we needed to can our own. A future post will include our recipe, which turned out very well. Another year, I plan to try this recipe for kumquat marmalade. The vinegar kick of our pickled kumquats is not to everyone's taste, and I imagine marmalade might meet with wider acceptance.